Financing cleantech startups as well as cleantech funds is a tough game. Investors aren’t happy yet with their returns. Consequently, startups and VCs need to reassess their strategies and look for long-term investors with strategic interest such as corporates, family offices and governments. 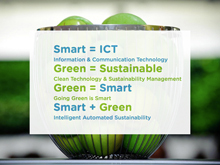 To find advice from industry insiders we look forward to joining the Cleantech Forum Europe in Bilbao taking place on 16-18 April 2013. 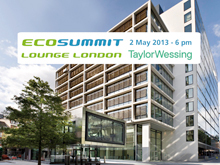 Ecosummit supports the event and we interview Richard Youngman, Cleantech Group’s MD for Europe and Asia, to warm up for the conference and discuss the current market environment. 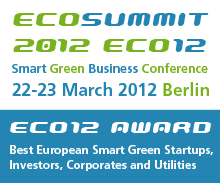 Richard will also speak at Ecosummit Berlin 2013. 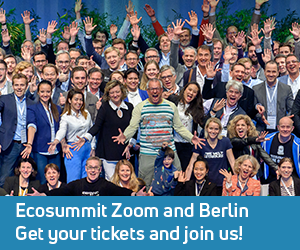 Pressemitteilung: Mobile Economy GmbH organisiert den dritten Ecosummit am 22.-23. März 2012 in Berlin. 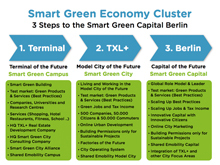 Die internationale Konferenz für Smart Green Business lockt 400 Topmanager von Investoren, Startups, Konzernen und Energieversorgern in die Hauptstadt. 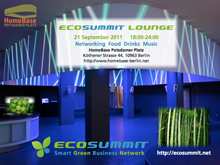 Auf dem Ecosummit 2012 (ECO12) geht es um Cleantech, erneuerbare Energien, Elektromobilität, Smart Green City, Startup-Finanzierung und Nachhaltigkeitsmanagement. Der neue ECO12 Award zeichnet die besten intelligenten grünen Unternehmen in Europa aus. At Ecosummit 2011, Jan Michael Hess (Ecosummit) moderated the panel Young Future Mobility Leaders with (from the left) Konrad Erzberger (Tamyca), Michael Kuhn (car2gether, Daimler Business Innovation), Beres Seelbach (Lautlos), Klaus Dibbern (Flinc) and Knut Hechtfischer (Ubitricity). We all agreed that the Sharing Economy will change the automotive industry. 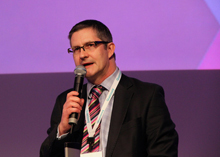 At ECO11, the consultant and automotive expert Gregor Matthies, Partner, Bain & Company, gave a well-prepared overview of the Electric Mobility market. It turns out that German car makers are not leading the development of new EVs which I personally regret. At the same time, this offers new business opportunities for startups that want to develop new electric future cars and sell them later to the OEMs.